Your article, “The Great Egg Crisis hits Mexico,” fails to properly place that country’s current- food shortage within the larger context of Mexico’s 21st century food security problems. 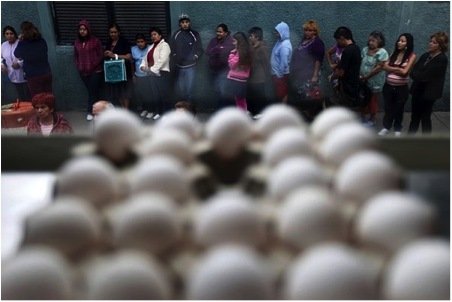 The huge spike in the price of eggs, an essential commodity, is the latest example of how Mexico’s food access difficulties are being drastically affected by the free trade regulations by which Mexico must comply. Additionally, your article fails to discuss the impact of global warming, environmental degradation, and the effect of NAFTA on Mexico’s s strained agricultural sector. Given these issues, along with overpopulation and a rapidly changing global climate, Mexico’s agricultural sector will be unable to adequately respond to the nation’s food demand. Thus, food price increases on pollutry supplies, for example, hinder the ability of the country’s agricultralists to counteract these diffculties, where 47 percent of Mexicans already live below the poverty line.1 As such, the so-called Great Mexican Egg Crisis of 2012 should not be recognized as an unique event, but rather the lastest more economic phenomenon that foreshadows Mexico’s inability to assure its food security in the 21st century. Mexico: A Model for Developing Countries?